Watch how the Round 10 unfolded between Wesley So and Garry Kasparov of the US Ultimate Blitz Challenge 2016. After Wesley So smothered him in this blitz game, perhaps out of frustration or embarrassment (who knows?) — Garry Kasparov walked out immediately of the playing hall. Check out also how the commentators described how astonishing Wesley was playing in this game. Me, personally, after watching this video, I think this is what will bring spectators to this sport — via blitz games like this. 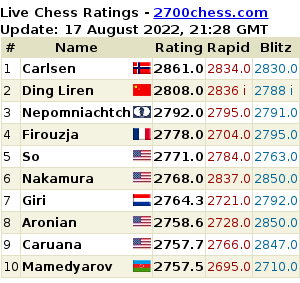 Thus, I think chess event organizers should find a way to integrate blitz games into their events. You’re invited to like our page. Less queen, Na set-up galing parang si chok.